Not a bad album when you consider it's a handful of original NWOBHM tracks and some new ones aping the style. 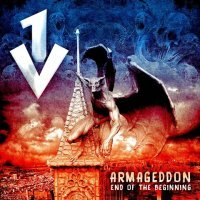 I think that UK band V1 may hold the record for the longest time between formation and debut album, as they first got together way back in 1979, when former Iron Maiden guitarist Terry Wapram got together with ex-Maiden vocalist Dennis Willcock to form their own band. The rest, as they say, is history – ancient history to be honest because the band got precisely nowhere. There was a wave of interest when their original demo re-surfaced a couple of years ago, so the duo decided to record a full album with bassist Dwight Wharton and drummer Gareth Dylan Smith. Your enjoyment of V1 will depend on your love for what I'd call the "classic NWOBHM" sound which is very basic Heavy Metal with average vocals and limited creativity. If V1 had been signed back in the day, I can pretty much guarantee they would have lasted one... maybe two albums and ended up as a footnote remembered affectionately by some with possibly a track on a Lars Ulrich compilation tape. The problem here is it's all so depressingly basic. "No frills" is the charitable description from a glowing review elsewhere and I suppose that's fitting as you listen to twelve tracks that never really show a spark of original thought. Willcock's vocals are very much of their time, even now, and to be fair perfectly suit the idea of a 1980 odd British Heavy Metal album. If this had been dug up from the vaults and polished up for release as we hear it now, I would say it's not bad for a thirty-five-year-old album, but not that good either. 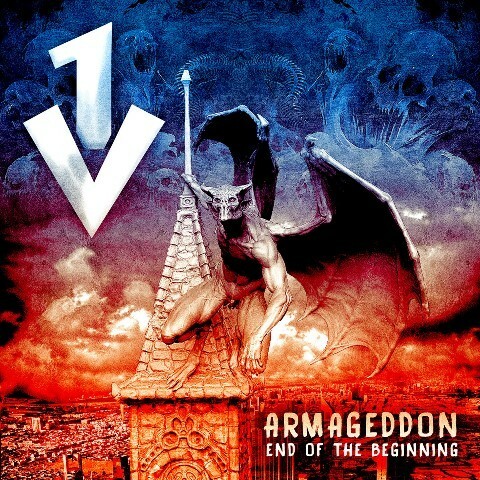 'Armageddon: End Of The Beginning' is not a bad album, really, when you consider it's a handful of original NWOBHM tracks and some new ones aping the style (and doing it well). It's just that it's such a bog-standard example of the genre that it's hard to get excited. The Iron Maiden link is being exploited (which is no surprise, really), but V1 would have paled in comparison, mainly because Steve Harris knew how to write songs that stood out amongst the crowd. V1, on the other hand, were nestled within that crowd, destined never to get out. Armageddon? More like a scrap outside The Ruskin Arms in 1981.